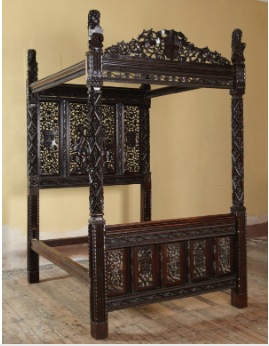 THE last Tudor bed in existence, made to mark Henry VII’s accession to the throne. This 527-year-old Paradise State Bed of Henry VII and Elizabeth of York was rediscovered in 2010. Henry Tudor, who became Henry VII, defeated Richard III at the Battle of Bosworth Field to take the English throne and found the Tudor dynasty. The Paradise State Bed is an unrivalled masterpiece of 15th Century oak carving which was commissioned almost immediately after Henry VII was crowned to celebrate his marriage to Elizabeth of York and the end of the War of the Roses. So much has been written about the life and times, love affairs and political maneuvers of Elizabeth I. Yet only a few books have approached Gloriana’s life from the behind the façade she presented to the world. Anna Whitelock succeeds in giving us Elizabeth with her best friends and confidantes. These women surrounded her and applied the make-up, gowns, and jewels each day to take her from mere mortal to dazzling queen. They served her well, kept her secrets, and did what good friends do: work on our behalf. There were even a few, like Kat Ashley and Dorothy Bradbelt, who politicked to help marry the queen. And others, who loaned Elizabeth their maid’s clothing or had private dinners so she could be with Lord Robert Dudley. Whitelock reveals an Elizabeth who is in turns vulnerable, loving, inconstant, and even quite spiteful. Elizabeth did a better job than anyone before her, and arguably after her, in creating a brand that even in her day became iconic and magical – which was of course the point. Against the backdrop of assassination attempts, marriage suitors, court scandals, favorites and power politics, Whitelock’s details of Elizabeth’s life do not get lost in the larger themes of Elizabeth’s reign but rather enhance our understanding this great queen and her Court. A quick visit to the author’s website tells me that the BBC has optioned this book for a possible TV series, which would if done well would be terrific. And let’s agree that the BBC does this type of program really well. Bring it! This entry was posted in Book Review, History, Non-fiction, Tudors and tagged Elizabeth, Elizabeth I, Elizabeth I of England, history, non-fiction history, Richmond Palace, Tudors. Join the over 3,500 subscribers to my blog! Want to hear more? Sign up to receive my blog posts and alerts.